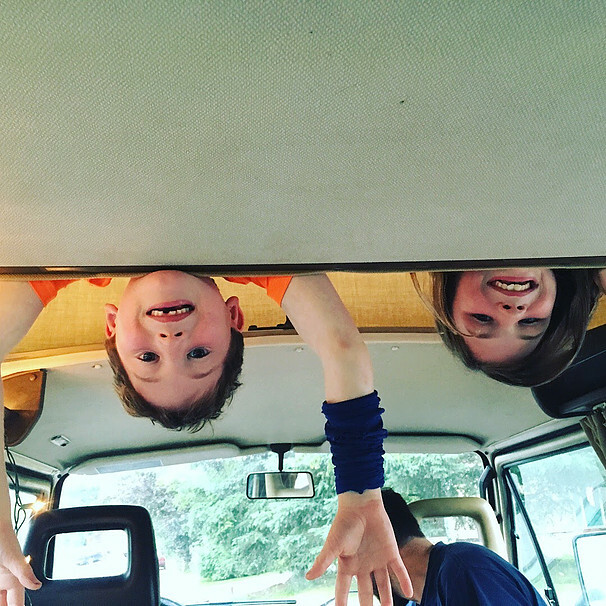 What could be more fun than hanging out in the loft of a VW Vanagon? Not much, say these happy customers of Trickster Trips. Image courtesy TT. 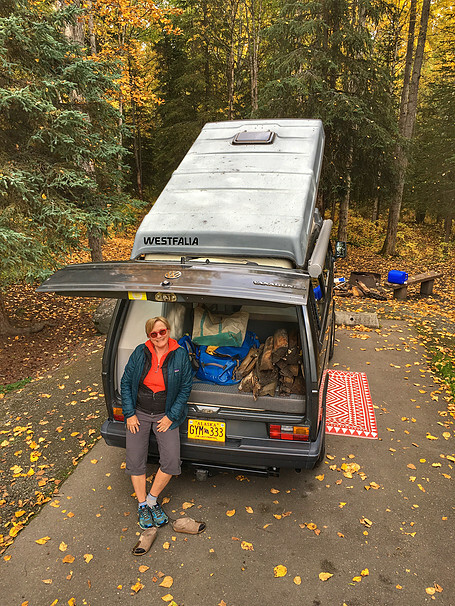 When AKontheGO sits down with Mandy Morell, owner of Trickster Trips, a new rental service featuring classic Volkswagen vans. Of all the vehicles I’ve had the privilege of driving, none has ever captured the essence of roadtripping quite the venerable Volkswagen Van. A Volkswagen, known as “The people’s car,” has graced home driveways of my family since before I even arrived on this earth, and one or two will continue to do so as long as I am able to push that clutch in and throw the gear into first. 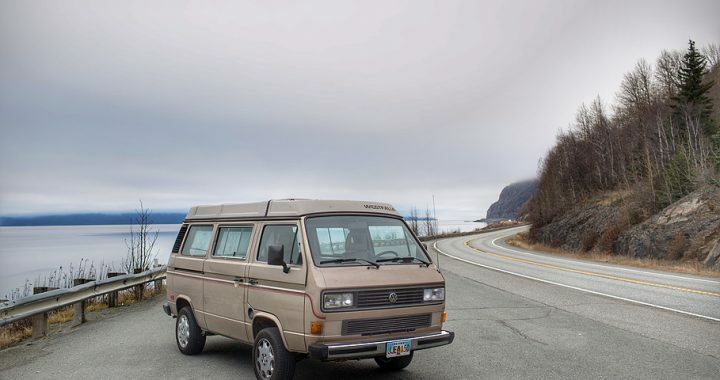 Ditch the worries about cold, rainy Alaska camping and rent a Vanagon from Trickster Trips. What’s it all about? Trickster Trips offers three different Volkswagen vans, all “tricked out” for families wanting to rough it, but not too roughly. With everything you need for sleeping, cooking, driving, and playing around Alaska, Trickster Trips is an excellent option for weeklong (or more) exploration. What’s included? Beds for four (two doubles), including sheets/blankets (or bring your sleeping bags); cooking supplies/utensils, spices, dish soap, sponges, etc; outlets for tunes (bluetooth and/or USB); and maps/books about roadways in Alaska (ahem). Add-ons like wi-fi, solar showers, tents, and even groceries can be arranged. And, folks, you can ask Mandy to meet you at the train station or airport for those who want to be “on the go” as quickly as possible. Remember, there is NO limit to the amount of miles you put on the van, and Morell has a few great ideas for each rental category. Northern lights, snow, mountains – Trickster Trips has you covered. 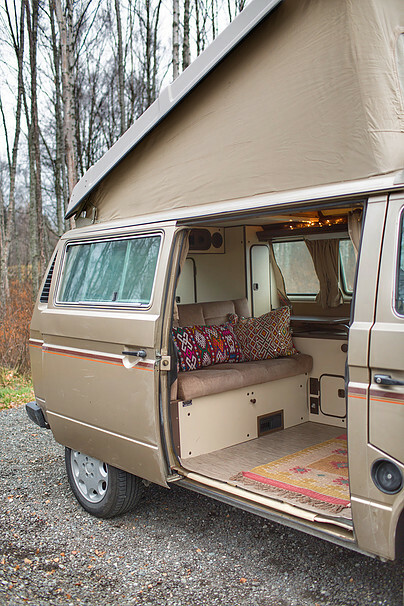 Clean, comfortable, and perfectly suited for small-group road trips around Alaska. Image courtesy Trickster Trips. In just a few weeks 2018 will begin, and there’s no better time to plan a summer road trip (heck, or a spring one) than right now. Stay tuned, because AKontheGO is all over this gig, and we’ll be partnering in 2018 with some fun deals and opportunities for friends of our travels. Posted in Alaska Road Trips, Camping and tagged Alaska, Camping, Family Travel, fun on the road, road trips with kids, Trickster Trips, Volkswagen, VW rentals, VW van life.